The Cheltenham Festival is arguably the greatest horse racing meeting in the world and we've got it covered. We'll bring you the best tips, latest results, and best bookies offers to make sure you beat the bookies. 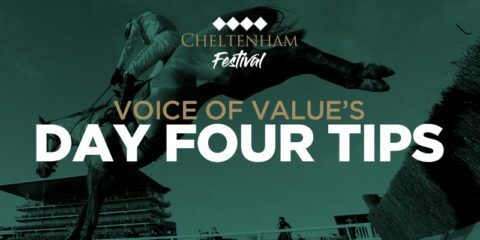 Let our expert tipsters, Alan Thomson and Voice of Value guide you through all 28 races at the Festival. Have £10 Bet Risk-Free on ME! 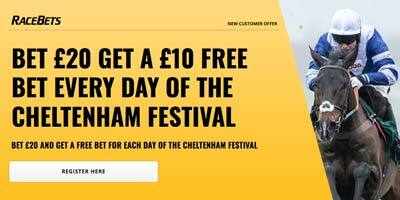 I'm giving you the chance to have a £10 free bet every day at the Cheltenham Festival. 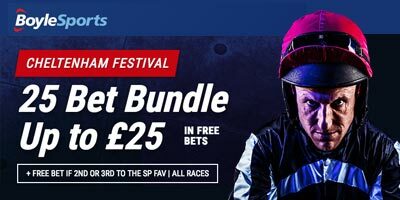 We'll keep you right on which bookies are offering enhanced odds, free bets and bonus offers throughout the Festival. 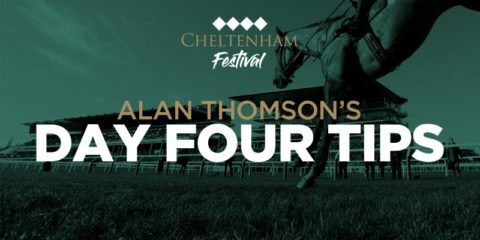 I'm giving away a total of £250 this week in my Daily Cheltenham Tipster Contest. Don't miss it. Get all the info you need on each race via the detailed racecards available over at Sporting Life. The Festival gets under way with Champion Day, when tens of thousands of racing fans descend on the course. The big race of the day is the Champion Hurdle. Day two of the Festival is traditionally known as Ladies Day so keep your eyes peeled for some glamorous fillies. On the course the featured race is the the 2018 Queen Mother Champion Chase. Among the highlights of Day 3 are the World Hurdle, The Ryanair Chase and the Kim Muir. The Festival closes with another great day's racing including the much anticipated Cheltenham Gold Cup. 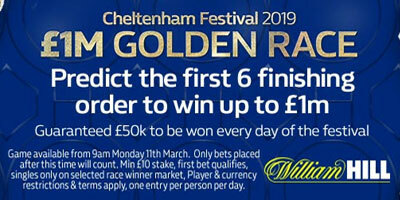 The Cheltenham Festival always throws up some brilliant offers for us punters as bookies are desperate for us to open up new accounts and to bet with them. 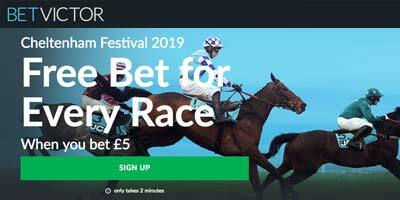 Bet £5 Get £1 Free Bet for Every Race at BetVictor. New Customers Only. 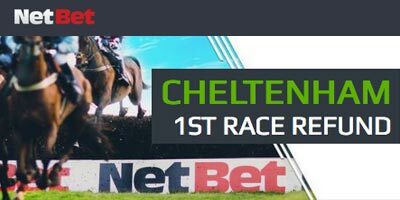 Deposit and bet £5 on any sports market at odds of 2.00 or greater, before the first race at the Cheltenham Festival and receive £1 free bet for each race, credited each day, expires at the start of the last race; and a £10 Casino Bonus, wager x40 to withdraw, 7 day expiry. Cashed out bet excluded. Credit and Debit cards only. Offer available from 09:00GMT on Tuesday 5th March 2019 until 16:50GMT on 12th March 2019. Geographical Restrictions, T&C’s Apply. Please Gamble Responsibly. 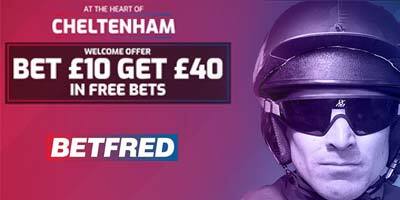 Register using Promo Code: CHELT40, bet £10 on any Day 1 Cheltenham race (odds evens or greater) & get £40 in Free Bets throughout the Festival. Deposit with promo code: 20FREE to claim up to £20 in free bets. 18+. New UK+IRE customers. Paypal and certain deposit types and bet types excluded. Min £5 bet within 14 days of account reg at min odds 1/2 = 4 x £5 free bets. Free bets valid for 7 days on sports stake not returned, restrictions apply. T&Cs apply. 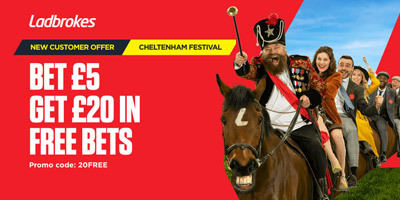 Place a £10 Ante-post bet, Get £10 each day of the Festival. New customers only. 18+. BeGambleAware.org. Minimum deposit £10. 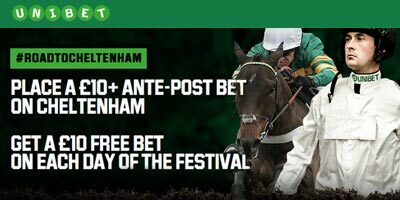 Place a £10+ ante-post bet on Cheltenham Festival of odds 1/1 (2.0) or greater. A £10 Free Bet will be given by 10:00 (GMT) each day. You will receive the free bets regardless of whether your qualifying £10 bet wins or loses. Free bets will expire at the end of each day given. T&Cs apply. Money back in cash if your first bet loses plus weekly free bets. 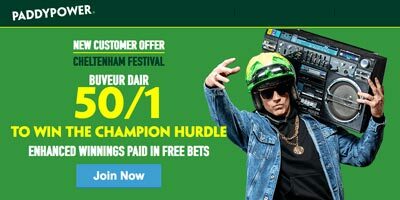 Get a HUGE 50/1 on Buveur Dair to win the Champions Hurdle. New Customers can get Buveur Dair at an enhanced 50/1 to win Champion Hurdle. Max Stake £1. Winnings paid in free bets, valid for 7 days, only deposits with cards/Paypal count. Exchange and multiple bets excluded. T&C’s Apply. 18+|Gamble Aware. 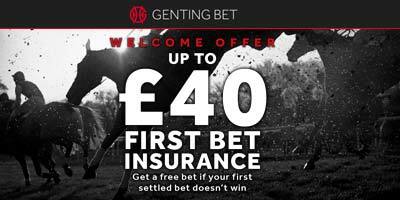 Up to £40 Free Bet if your first bet doesn't win at GentingBet. Claim up to £100 in Bet Credits at the world's biggest online bookie. Bet £10 for the chance to play to win £1million, by predicting the first 6 horses in a race. Starts Monday 11th March. Game available from 9am on Monday 11th March. Only bets placed after this time will count. Min £10 stake, first bet qualifies, singles only on selected race winner markets. Player & currency restrictions & terms apply, one entry per person per day. Get a refund up to £10 if your horse loses the first race each day at Cheltenham. New customers only. Valid once per customer. Bonus expires after 30 days. Offer expires 31.05.19. 7x turnover at 1.6 minimum odds. Skrill and Neteller deposits excluded. 18+ only. 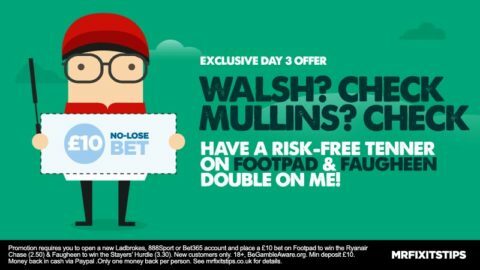 Choose to claim up to £30 in Free Bets at Betway. Join Betfair today for a free £20 Bet on the worlds best betting exchange. 18+ New customers only. Mobile Only. £10 min deposit activates 1x 100% in-play profit boost. Max stake £10. Max extra winnings £100. Valid for 30 days. Skrill/Neteller deposits do not qualify. T&Cs apply. 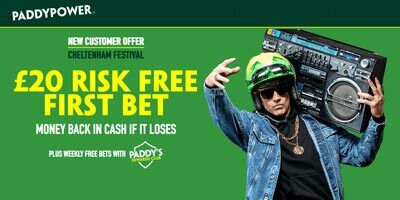 Claim two £10 Free Bets and two £5 Casino Bets at 21Bet. Get up to £50 in bet credits when you join Sportpesa. 18+ New customers only. No e-wallets. Applies to first settled bet. 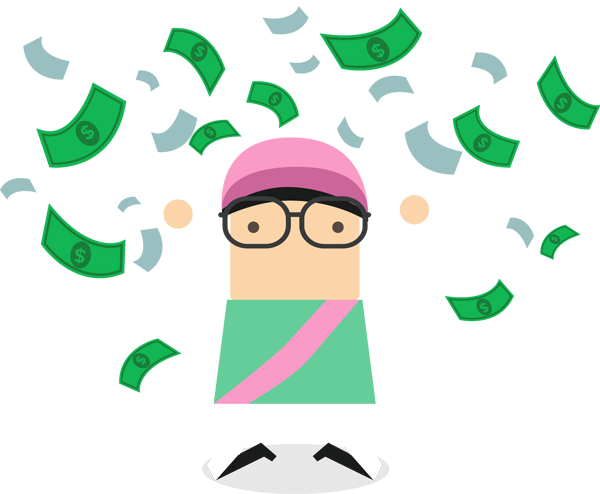 Matched bonus paid in bonus credits. Bonus credits must be wagered five times. Min odds 1.8. Min stake £10. Max stake £50. T&Cs apply. New customers only. Must stake 6 qualifying bets. Horse racing bets do not qualify. Min stake £10. Max bonus £30. No e-wallets. Min odds evens (2.0) or 2/5 (1.4) for combos. 18+. T&Cs apply. Earn either an iPad or £300 in cashback at Spreadex. 18+ New customers only. Bet on qualifying spread bet markets and get cashback after 28 days matching your stakes, up to £300 max. If you hit £300 you can instead choose an iPad Wi-Fi 32GB 2018 model. New players can get up to £28 bonus at Fun88. Available to new customers only. Mus stake six qualifying bets. Horse racing bets do not qualify. Min stake £10. Max bonus £28. No e-wallets. Min odds Evs (2.0) or 2/5 (1.4) for combos. 18+. T&Cs apply.